Ice-fishing so far this ice-season has been strange. First the ice in my area of north Iowa is safe, then it isn’t. I haven’t been out much, which means that I’ve been doing a lot of thinking about fishing, through the ice and otherwise. Awhile back I shared two of my favorite ways to catch fish in open water: a small jig, probably an eighth ouncer, tipped with either plastic or a minnow for walleyes, and also weedless baits fished for largemouth in shallow, heavy vegetation. Those are both ways that I like to fish, but when it comes to just catching fish, numbers of fish and the chance for big ones, I have another favorite technique: I like to throw crankbaits. Here’s why and how. This bass and many others, along with some walleyes, liked the looks of Mike Frisch’s crankbait in August along a weedline. Back in the early 90’s, there was a fishing event held on Gull Lake near Brainerd, Minnesota. It was a fund-raiser for a local camp, and it attracted some of the Midwest’s best anglers. Boaters fished with a pair of partners in the morning and another pair in the afternoon. The format was to weigh your biggest walleye, largemouth bass, and northern pike from the morning and afternoon round. Sometimes your partners were accomplished anglers, other times they were folks who just liked to go fishing. I learned early on that we needed to employ a technique that was simple to use but was also attractive to those three species of fish. That technique was throwing crankbaits along a weedline. By doing that, the team that I was on finished in the top five every year but one that I participated, and everyone caught fish. We had a good time. Crankbaits are outstanding for walleyes, pike and bass, year ‘round, but especially from early summer into mid-fall. They catch fish along the weedline, over rock piles in the shallow to mid-depths, and pretty much anywhere else where the crankbait can reach the depth where the fish are. If I’m keying on walleyes, I’ll probably be using a Lucky Shad. These are outstanding baits. My favorite colors are Violet Alewife, Chrome Blue, Chartreuse White, and Yellow Perch, although lots of colors will catch walleyes. Lucky Shad are long, thin baits. Spinning tackle works best. Fifteen (15) pound test P-Line XTCB Braid on a Lew’s Speed Stick in medium heavy 6’6” or 7’ and a Lew’s Speed Spin or Crush reel will rip through weeds easily and provide a solid hookset. 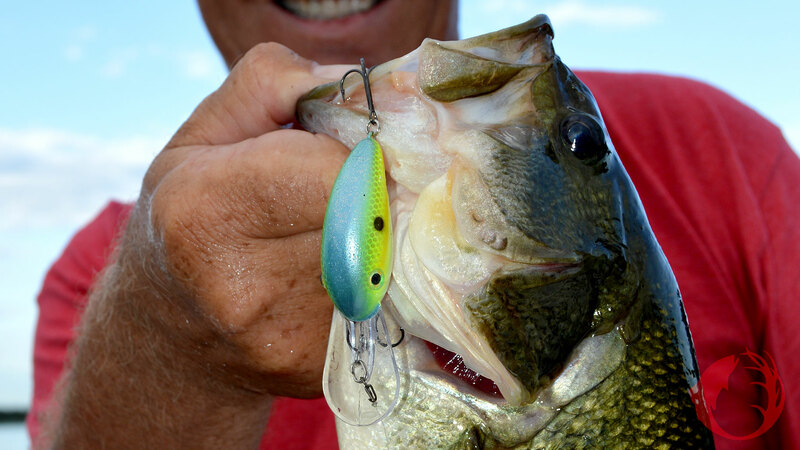 If largemouth are the preferred target, a shorter, fatter bait, something like Strike King’s Pro Model Crankbait in the 4 or 5 size that runs in the 7- to 10-foot range will be tied on. In the summer, bass, walleyes, and pike along the weedline really like these baits. Bluegill, perch, shad, crawfish, or blue/chartreuse will be go-to colors. We’ll be casting this bait with baitcasting gear: Again, a 6’6” medium heavy rod in one of the Lew’s Speed Stick Series will be about right much of the time. Team it with a reel that retrieves line at a pretty fast speed. One of the Lew’s BB1 Series will excel. We’ll probably use the same line that we did for walleyes, or maybe go a bit heavier. Make long casts, cover lots of water and catch lots of fish, probably a mixed bag. This summer, tie on a crankbait, find a deep weedline, and go fishing. If you do so, you are putting yourself in a position to have a very good day of fishing and catching.